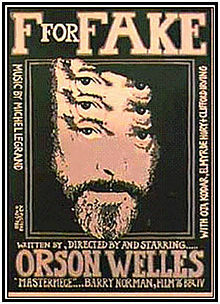 Orson Welles’ free-form documentary about fakery was re-released on the 24th August in the UK . It focusses on the notorious art forger Elmyr de Hory and Elmyr’s biographer, Clifford Irving, who also wrote the celebrated fraudulent Howard Hughes autobiography, then touches on the reclusive Hughes and Welles’ own career (which started with a faked resume and a phony Martian invasion). Although it wasn’t well received on its initial release it is now thought of as a classic. Along the way it explores Intentist ideas of authorship, meaning and identity.